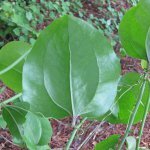 The roundleaf greenbrier(Smilax rotundifolia) is often underestimated as a wild edible. Even most of the published literature I have seen doesn’t hightlight the full utility of this plant as a wild edible. 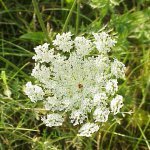 In reality this plant is an extremely useful wild edible at the right times of year. The roundleaf Greenbrier is plentiful in the eastern half of the US. The information in this articles likely applies to other species in the genus but Smilax is a diverse genus so there could be exceptions. Greenbrier is a visually unassuming plant especially when it’s mixed in with other prickery vines and shrubs such as multiflora rose, blackberry, raspberry, and barberry. 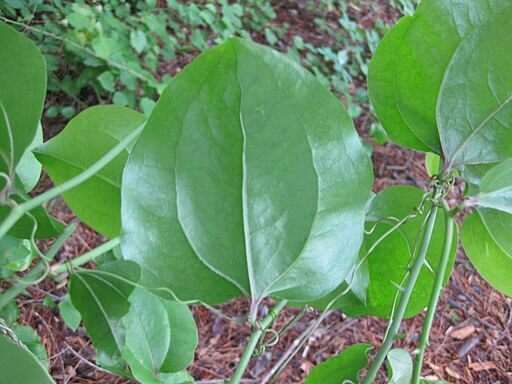 roundleaf Greenbrier is a native plant and was likely a commonly used wild edible by native american people. Most literature highlights the use of the roots as a starchy substance that can be added to foods. In my opinion this is somewhat of a secondary use compared to the other parts of the roundleaf greenbier that are edible. The new growth in the spring is an abundant and delicious vegetable. The texture is reminiscent of small asparagus but the taste is very mild with a hint of acidity. The new greenbrier growth can be eaten raw or cooked, just make sure it is new growth that hasn’t aged to the point that the thorns have hardened. 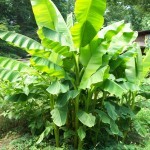 The leaves are also edible in the spring and summer but they get tougher in the summer. The leaves too have a pleasant mild taste and can be eaten raw or cooked. 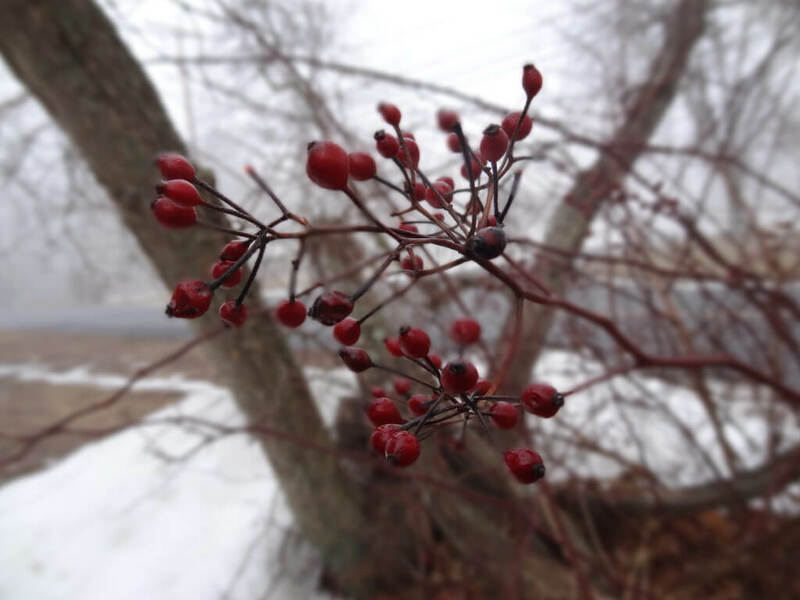 There is another characteristic that is not often highlighted in most published literature and that is the edible berries that persist through the winter. There is not much substance to the berries since there are large seeds inside but any berry that persists throughout the winter and tastes good is something I add to my list of forageable foods. 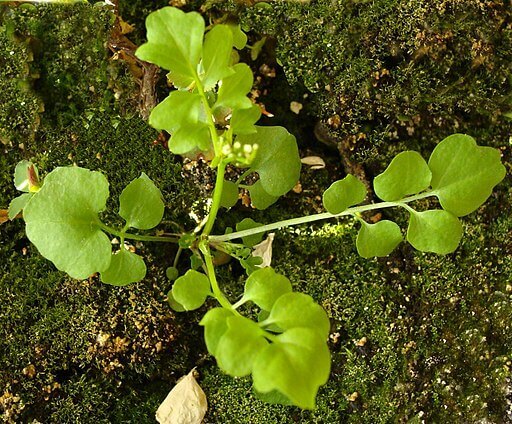 This plant must be a truly wild edible because it does not have a common grocery store counterpart as is the case with plants like wild mustard greens and wild chicory plants. This fact makes it difficult to get good nutritional information. The good news is that according to www.pfaf.org there are no hazards associated with this plant. That and the fact that it doesn’t have any strong bitter components indicates that this is likely a very nutritious plant(extremely bitter flavors can sometimes indicate toxins). The mild acidic flavor could be ascorbic acid(Vitamin C) which is present in many wild edibles such as pine trees. Greenbrier has some history of medicinal use. A tea made from the leaves was traditionally used to sooth upset stomach and a poultice made from the leaves was used to sooth different types of external pain. 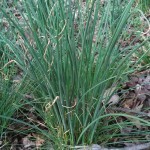 Once you know what to look for this plant is nearly unmistakable. 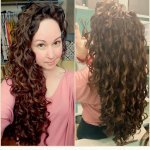 There are a few main characteristics to look for. This is always a climbing vine with almost no growth toward the width of the vine, in other words it mostly grows longer, not wider. The width of the vine is usually not much bigger than ¼ of an inch in diameter. The vine is always solid green color, even in the winter although it may be speckled with dark sooty mold in a few places. 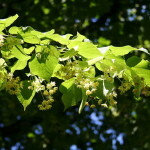 The vine grows in messy bushy masses on wooded edges up to around 10′-20′ high. You should start being able to spot these masses from a distance once your familiar with the growth habit of greenbrier. 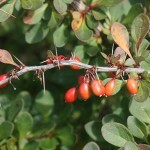 The thorns have a characteristic shape and growth pattern. They are not crowded on the stem, they appear clearly separated , sometimes by a few inches. 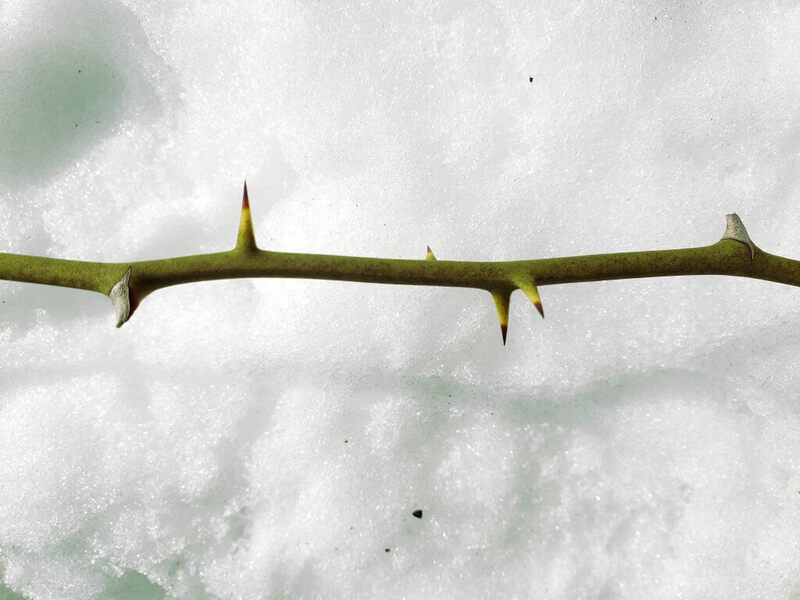 The thorns grow straight off the stem at roughly 90 degrees, they are not curved or tilted in any way. 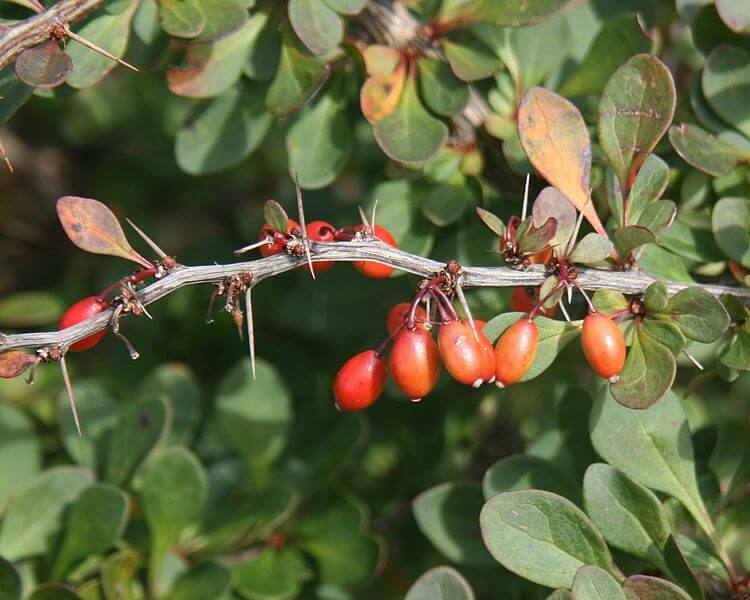 this will help you distinguish greenbrier from wild rose which has large curved thorns. Small tendrils can be seen on the vine assisting with it’s climbing behavior. The black greenbrier berries develop in loose bunches in the fall and persist through the winter, I have seen them stay on the vine all the way into march. You can see them from a little bit of a distance so you won’t need to climb through looking for them, but you might need to climb through to get to them. The only caution with this plant is the thorns. You can get your legs tangled up when you’re climbing through to get the berries. Roundleaf greenbrier is an often underutilized native wild edible. 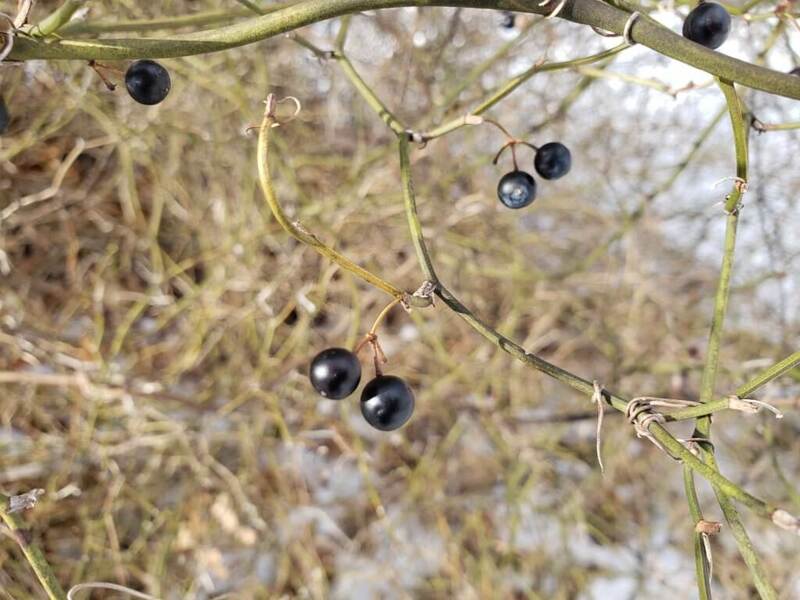 This plant has edible parts that are available during much of the year, even in the winter when there are not a lot of other wild edibles available. 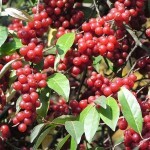 Always practice responsible harvesting practices when foraging but with this plant You can harvest a substantial amount of new growth and berries because harvesting the new growth and berries does not kill the plant and it is a common and resilient plant so you don’t need to worry too much about hindering plant growth or reproduction. 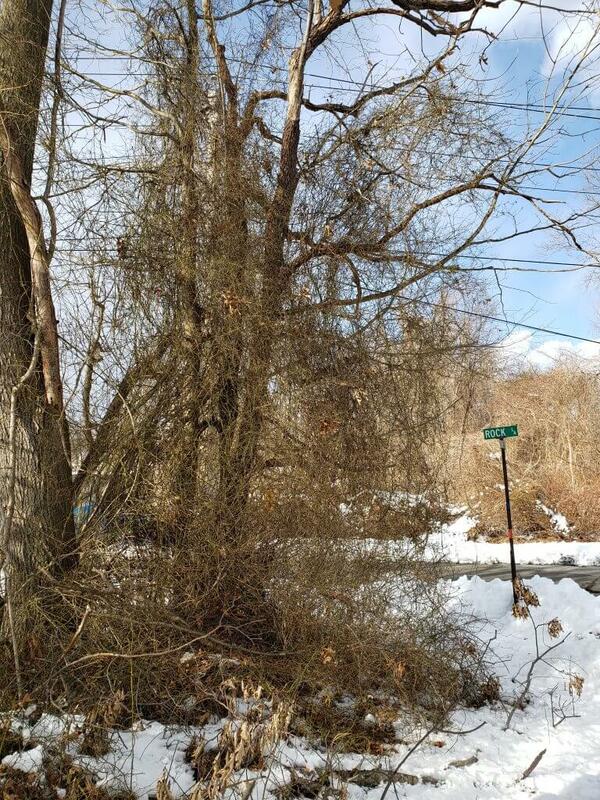 So this winter and spring take a look at wooded edges for the messy vine masses that are characteristic of roundleaf greenbrier, they are perennial so once you find them you can return year after year. 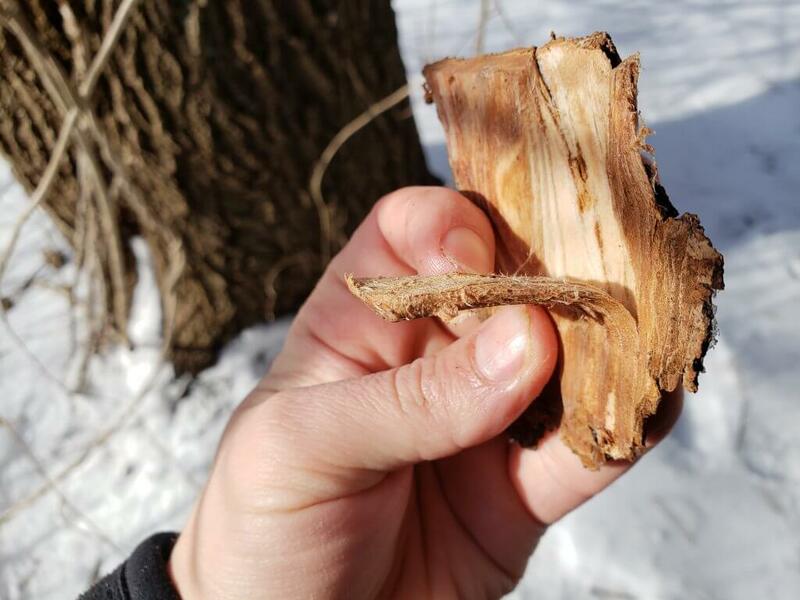 Eating the inner bark of certain trees is something that is often referred to as a “good” source of food in survival situations, especially in the winter when not much else is available. 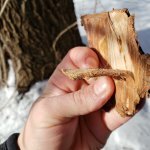 I wanted to investigate this claim so I made a list of 5 of the most common trees in the northeastern US that have edible inner bark. I sampled each of these trees as well as putting together a video to go along with this article. Sampling the bark was a little difficult because I had to only do this on trees or large branches that were going to die anyway. 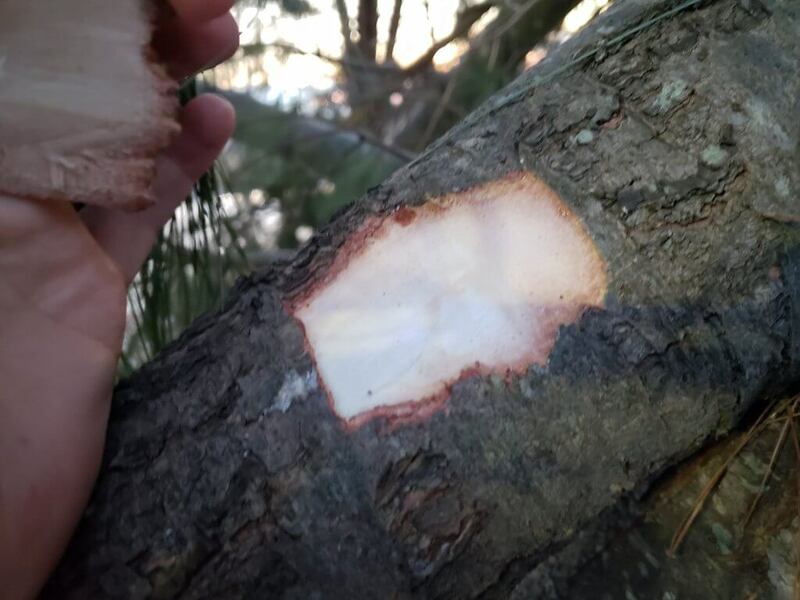 The reason for this is because the most substantial source of inner bark is lower on the trunk and cutting this part of the tree can damage all portions of the tree above it. There were 2 main characteristics I was looking for. The first is the taste of the inner bark, I wanted to see if it was reasonable for someone to consume a large amount of it. The second thing I considered was the amount of inner bark and ease of harvesting. 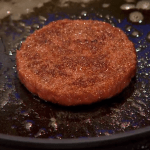 I wanted to be able to get more information on the sugar and starch content, this is what would contain needed calories in a survival situation. It is casually mentioned in a few places online that inner tree bark contains 500-1000 calories per pound but I did not find verified sources with this information for each tree. 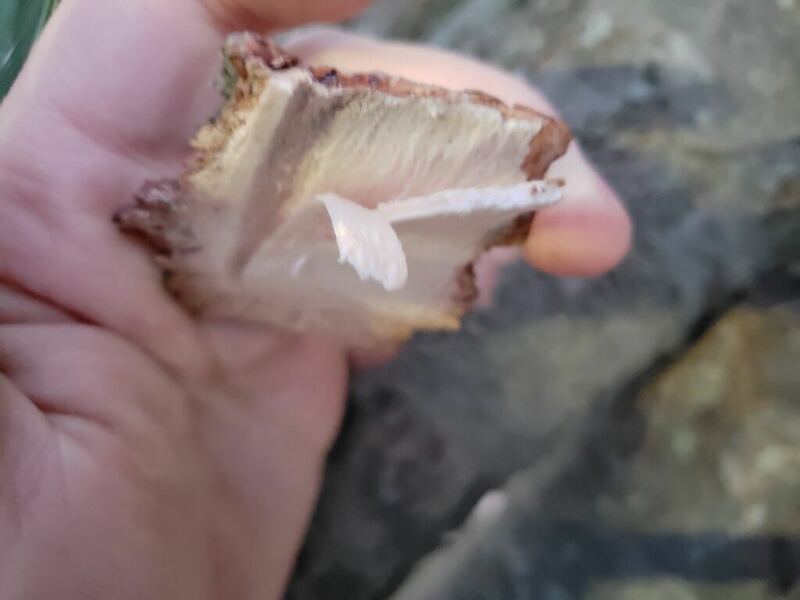 Although while I was eating the inner bark I did try to notice weather the inner bark seemed to be mostly fiberous or if I tasted sugars and starches while I was eating it. The inner bark layer of a tree overlaps with the phloem on the tree, the phloem carries nutrients up and down the trunk from roots to leaves in the spring and from leaves to roots in the summer and fall so it makes sense that some of these sugars and starches would remain in this part of the tree over the winter. In this article I have arranged these trees in order from worst to best in my opinion based on the feasibility of eating a substantial amount of the inner bark. This is the related video showing much of the things that are talked about in this article. I wanted to test out eastern hemlock because it is a common native forest tree in my area. The needles make a great tea so I assumed the inner bark would be tolerable. Based on my experience the inner bark is not tolerable. It tasted awful, and it was very bitter. This is a tree that I would recommend for tea but I found almost no use for the edible inner bark. I couldn’t consume enough inner bark to be able to judge weather it seemed to have starch or sugar. That being said it is possible that processing the inner bark more could make it palatable. For example drying, grinding and mixing with flour or boiling it in changes of water might work. 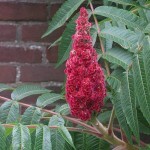 This tree has many edible uses, such as the resin, the immature cones, and the new growth in the spring. The inner bark layer on spruce trees is thick and soft which makes it relatively easy to harvest. The taste is strong but It’s something you could eventually get used to. I would consider this a good option for edible inner bark, but not the best mainly based on the strong flavor. After chewing the inner bark it seems that this tree does have a substantial amount of sugars and starches. It doesn’t taste sweet, but it’s a lot less fiberous than I expected, the material does eventually break down in your mouth and become easy to consume. The good part about the edible inner bark on this tree is that the flavor is pleasant. Black birch is known for it’s “wintergreen” fragrance and flavor that is used in birch beer. The downside of using this tree for it’s edible inner bark is that unlike the other trees on this list birch inner bark is not soft, its rather dry and grainy, kinda like eating sawdust and it’s difficult to separate from the outerbark. I ate it raw by itself but I have heard that it makes a very good option when adding to other things such as dried grains or soup. Birch inner bark is known to contain a substantial amount of calories but probably not as much as spruce, pine, and elm. I don’t know definitively but I assume similar properties for other trees in this genus. 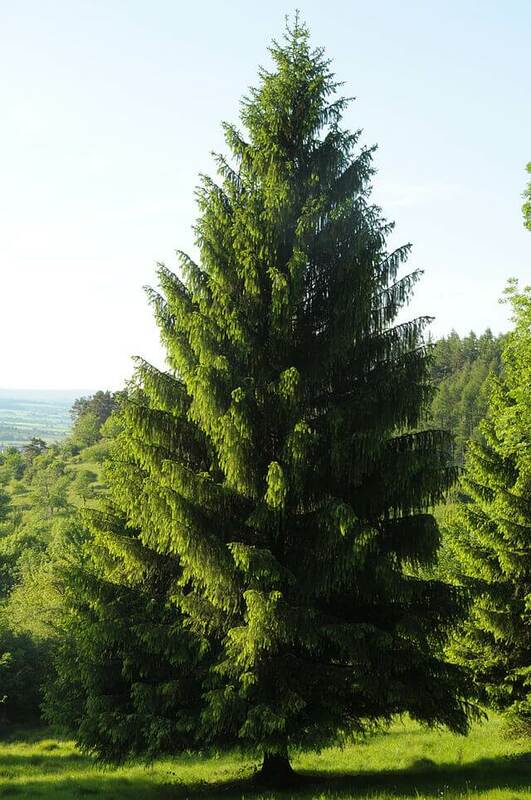 The pine tree is well known as a tree with edible inner bark. The biggest downside is the strong flavor but it’s easier to get used to then spruce in my opinion. The inner bark is thick and easy to harvest. The species that I sampled and featured in the video is white pine(Pinus strobus) but I assume similar properties for other members of the genus. Some pines may contain minor toxins so check with a website like www.pfaf.org or another trusted site before consuming any specific species. 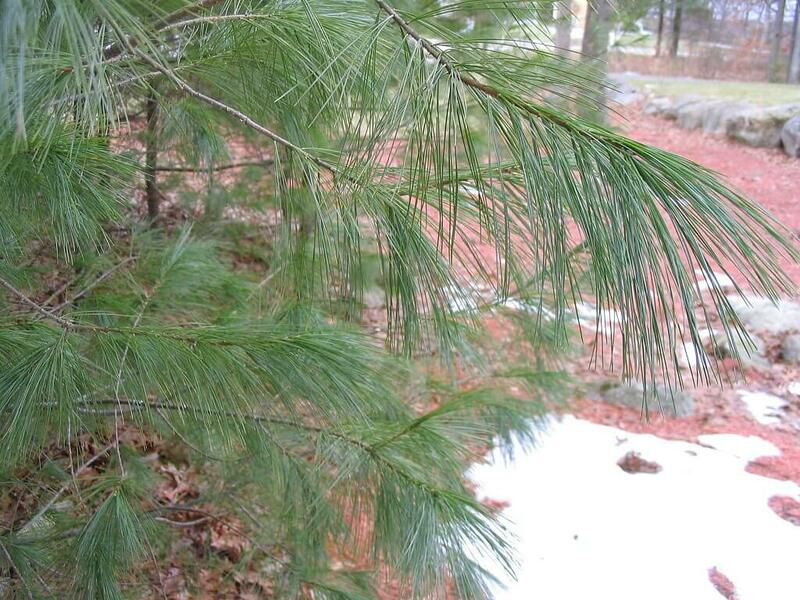 White pine is extremely common in New England and many other parts of the country so it’s very useful to know the edibility of this species. I could definitely feel that I was eating something other than wood fibers, the chewyness and resin content of the inner bark leads me to believe that there is a substantial amount of calories in white pine inner bark. I’m really excited to share this information about the elm tree. This was a completely pleasant surprise for me. I had known that elm trees have been used as a mucilaginous soothing agent but I hadn’t previously realized that the inner bark was edible. I sampled the siberian elm(Ulmus pumila) but I have read similar properties for other elms as well. The taste of the inner bark was very pleasant, it was even a little sweet with no bitterness or bad aftertaste. This plant is known to contain mucilage in the inner bark, this is a thickening agent that creates a gelatinous substance when added to water. So eating the inner bark of the elm does create a gelatinous substance which could be weird or offputting for some people. Its hard to say what the calorie content is but I did taste some sweetness which might indicate a significant level of sugars. Based on my experiences with these tree species It does seem that the edible inner bark of certain trees can give some needed calories in a survival situation. If you completely debark a tree as high as you can reach you would be able to obtain a lot of edible material with some calories. This would probably not be a good long term survival plan but the inner bark could definitely be added to other wild edibles to give a more balanced diet. If You’re relying solely on inner bark You would still probably want to get some meat or get out of your situation as soon as possible. Another thing that makes edible inner bark a good survival food for the short term is that you can carry it easily without worrying about spoilage even in hot or cold weather. Something else that I also took away from this is that eating certain inner barks like white pine and elm is actually a good food for all situations, not just survival situations. I’ve learned to add fallen logs and trees to my list of things to look for when foraging. I feel there is still much more for the wider foraging community to learn about how to find substantial calorie sources in the winter. If you have any experience with edible inner bark please leave a comment and share any info you have.